In ancient times, dance was an essential part of life. Dance was part of every civilization. There were dances of worship and dances to bring life. There were dances to protect warriors and to request a good harvest. No celebration was complete without dance. Long before dance was recognized as a form of exercise and whole body wellness, there was dance. In modern society, dance is an art form. It is a beautiful way to express emotions and feelings. Done correctly, dance can convey a story or message to the audience. This experience of becoming one with the performance is the powerful draw that brings people back. There are dances that are specifically designed for physical fitness. Zumba and Jazzercise are perfect examples. These dances are designed to help the dancer lose weight and build muscle mass. These dances have the same results on the body as aerobics. Some dances are not created for weight loss but the physical demands they put on the body results in weight loss. Hip Hop is one example. When you are performing a dance that has a fast pace, you will burn about the same number of calories as you would if you were running or jogging. Even a slower paced dances can burn a lot of calories if they carry a heavy intensity. Of course, weight loss only happens if you reduce your calories while increasing the caloric burn. As you continue to dance, your body will assist you by increasing your muscle mass where it is needed. By eating food that give you long-lasting energy, and reducing calories that are found in fast-burning foods, you will turn your body into a weight loss machine. As you lose weight, you improve your flexibility and endurance. You cannot ignore the effects of music. Pfizer Medical Team reports that music has a powerful effect both mentally and physically on the body. Music calms anxiety, eases pain, improves memory, and much more. Not surprisingly, it was found that music stimulates the brain. Music boosts stimulation mentally and physically. In other words, music makes your exercise more effective. It is not difficult for us to compare dance with other forms of exercise. Common sense tells us if we are physically moving and our heart rate is elevated, we are exercising in some form and capacity. The amazing results that dance has on the brain is a bit more difficult to grasp. In a study conducted by the Department of Neurobiology of Harvard Medical School, it was discovered that dancing is therapeutic in the treatment of patients with Parkinson’s Disease. Dancing elevates the mood by forcing the brain to produce higher serotonin levels. This “feel good” hormone physically reduces anxiety and stress. The repetitive notes in music combined with the repetitive motions of the dance steps, improves memory. The combination of these factors with other physical changes that happen in the brain has allowed experts to use dance in reducing the risk of patients developing Dementia and Alzheimer’s disease. Dance has been found to help children battle the symptoms of Autism. Depression in people of all ages has been increasing in the past few decades. However, when you break that down into ages, you find that the numbers of children and teenagers that are suffering from depression, low self-confidence, and anxiety have steadily increased of the past 80 years. This has led us to the staggering numbers of suicides of teens globally. One study shows that the primary reason for depression is loneliness. Children are spending less time with their friends socially and more time interacting electronically. Unfortunately, the internet is an easy tool to crush someone’s self-esteem. Putting children in dance class helps them break the cycle of depression. They are physically grouped with other kids their age. They learn to support each other and build each other up. 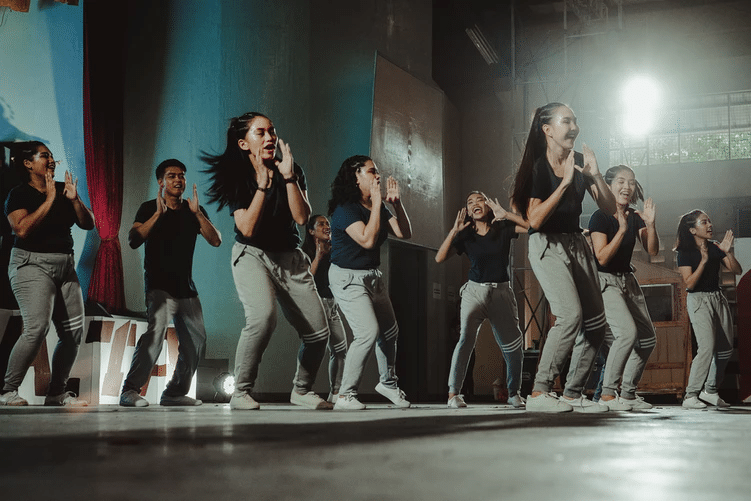 When a dance team takes the stage, the team is one. The success or failure of the team is a success or failure for everyone. As a child masters the art of dance, they learn to push on and not to give up. They learn that everyone faces the same challenges. Combine this thought process with the results of dance (listed above) and you soon have a child with a healthier self-image. Self-esteem is the key. When a person is comfortable with who they are, the effects of a schoolyard bully is diminished. This cycle continues and children grow stronger and less likely to become depressed. Interview dance classes and instructors before you sign up. Make sure that the goals you have will be met and encouraged in the class you choose. Ask about the levels of dance. If you are a beginner, you do not need to join a class of experienced dancers. Fashion often mimics dance. Certain sneakers, leg warmers, warm-up jacket, tights under skirts and many more items you see on the street, were first introduced on the dance floor. However, you need dance shoes, not street shoes. Your shoes must slide and glide when you demand or you could end up damaged ankles and legs. You do not have to spend a lot of money or a lot of time filling your dance bag. You can get everything you need at the best prices at Just For Kix, and order online. Before you begin, you should check with your doctor about any problems that physical movement could aggravate. Ask her for a good eating program to help you gain energy and lose weight while you are involved in the dance program. Try to get a friend or family member to join you. This gives you someone to lean on. Encourage each other and support each other on the journey to health. You may not need to practice every day to master your moves. But to benefit from the health benefits that come with dance and music, you need to practice every day. Keep the “feel good” hormones flowing. Kep stress and anxiety at bay, and build your health. Dance is and always has been the path to health. The sooner you begin, the better you will feel. So, get started soon. You will be glad you did.